​"Return to your house and describe what great things God has done for you." great things Jesus had done for him." ​I have always felt challenged when asked to share my "testimony". I didn't have the 'great change - saved from the depths of my sin' story that others had. I became a Christian at the age of 10... I mean, I was 10, how bad could I have been? Truth is, I have sinned alot more since I've been saved than before. But God's grace and forgivenss isn't a one time offer that only covers our past sin prior to salvation. His grace continues to cover us all our days. And during those days is when God wrote His story on my heart. 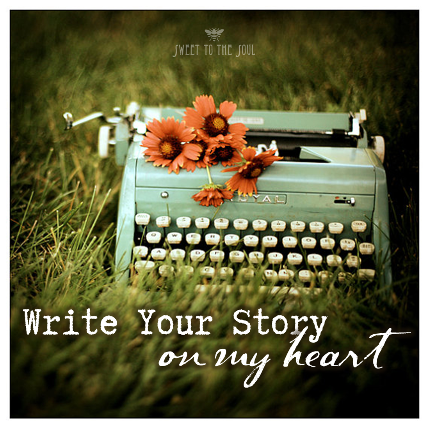 And now I love telling my story, telling others about the great things God has done for me. ​"God makes a home for the lonely"
​I grew up in the church and many of our family members have (and still do) serve in various capacities in the ministry. My family plays such an important role in my path to salvation, because I have always known that God placed me in this family on purpose. I was adopted as a toddler, the second of what would grow to be many children adopted over three generations. I accepted Christ as my personal savior at the age of 10. As a child and teenager my faith grew and I spent much time studying the Bible. As a teenager my faith was tested as my brother battled and eventually lost his life to leukemia. Devastating as this was, his life and testimony only strengthened my faith. ​But then as a young adult I strayed from church - I wanted to do my own thing. It was never an out right rebellion, but a gradual slipping that landed me at the bottom of the pit. * If breaking commandments had been an Olympic sport, I would have earned a gold medal. My bad decisions and poor choices often landed me in places where I did not want to be. Two failed marriages, both abusive, and two sweet babies later, God reached down to me and pulled me up out of my mess. "​He lifted me out of the pit of despair, out of the mud and the mire. He set my feet on solid ground and steadied me as I walked along." I attempted off and on but never could quite recapture the zeal I had in my teenage years for God, his word and the church. I remarried, gained a son and spent the next fifteen years living the average "moral Christian" life. Meaning, I really didn't do anything bad, but I really didn't have a relationship with God. I went to church off and on, I logged a ton of charity hours and donated money to many organizations. But then ten years ago everything changed... our family was on top of the world with great careers, good money, a new mcmansion, invitations to all the 'right' gatherings and the birth of our first grand-baby; everything that was worldly important. But in a split second it all imploded and everything that had seemed important in one moment lay in rubble the next. My daughter had been sexually abused... by her (step) father. The drama - years of drama - that ensued at that moment could never be fully explained. The details are not important, really. But what is important, is God. God - again - reached down and picked up this rebellious child of his and delivered me to safe ground, delivered my children to safe ground, and repaired and restored our broken hearts and broken lives. "and they didn't even smell of smoke." That is what God did for my family! But God also told me to go tell everyone about what He had done for my family. My families' ordeal had brought me to my knees and back to the feet of Jesus. And our relationship was restored and grew into something I had never experienced as a teen. "Return to your house and describe what great things God has done for you." what great things Jesus had done for him." ​Then three years ago God moved me to a new church home, brought a wonderful godly man into my life, and called me to serve the Kingdom. That is when my on-line ministry, Sweet To The Soul, began. God took the worst thing that happened to my family, rescued and reparied us, and turned it into a testimony and ministry. And He can do the same for you! I'm linking up today with Author and Proverbs 31 speaker Suzanne Eller over at her place, with lots of wonderful bloggers for #livefreeThursday. Would love for you to join us! Jana, oh Jana, what a beautiful testimony! What a beautifully restored life He has given you! And what a beautiful difference YOU make for HIS kingdom! #LivingFree with you today! I followed your link from Suzi's blog. It's so wonderful that God forgives us over and over again. Hi Carolyn! So glad you dropped by! It is wonderful indeed!! So glad to see you linking up your blog at Suzie's today! Beautiful, my friend. I love this story of God's redemptive power over even the most difficult circumstances. Only God. Thank you for sharing. Only God indeed! Everyday I am so thankful for His truths! And the new friends He is placing in my life! Thank you Suzie! Seeing Jesus in me is the most wonderful thing anyone could every say!! You are such a blessing! Jana, I was 11 when I accepted Christ as my Savior. I loved how you said "How bad could I have been...I've sinned more since I have been saved." I totally identify! A well meaning woman at church asked me one Sunday, when I was saying I didn't have a huge salvation deliverance experience, "Well, weren't you CHANGED? Didn't you see a DIFFERENCE?" My response? "I was ELEVEN, maybe I minded my parents a bit more for a time! Thankful for your words here today! Yes Ellen, I've heard that also. I never thought anything that I could say would be impactful because of not having that experience. But then it finally dawned on me, that my testimony was about me anyway! It wasn't about where I had been or what I had done, it was about God, about what He did. And if my testimony was never anything more that Christ loved me enough to give His life to save mine, that would be the most impactful testimony of all. Oh Jana, I'm so glad to know more of your story, because I see echoes of my own. I was saved at a young age, or I thought I was. I strayed in my early twenties, made several very bad decisions and then God rescued me from my own pit when I was pregnant with my firstborn. I can't imagine going through what you did with your daughter and her stepfather, but I do know how God can restore and use ALL things for His glory and our good. Rom. 8:28 is my life verse and fits so many of our lives well, doesn't it? "share from the deep places" love that Meredith! I have long held onto Rom 8:28! It has enabled be many times to move forward in faith even though all I wanted to do was curl up into a little ball. God is so gracious! I am looking forward to this chapter also... especially excited to be walking this path with so many wonderful women of God who inspire and encourage me every day! I am so proud greatful that God brought us together. I shine when you stand by my side. I love you! I love you too!! So grateful for all of your support! Yay you have your blog going! I'm sure it's going to be as beautiful as your creative images and a HUGE blessing to many!!!! Congrats!! Glad to follow you!! Oh Thank you Mary!! You are too kind! I have been procrastinating this alot! But now I am so looking forward to this chapter and seeing how God will use Sweet To The Soul. I have already been blessed beyond measure, so I just can't image what He has in store! Thank you for following me and being so welcoming! Your words pulled me along and left me feeling with you as you wrote. I am so sorry for the pay, the hurt, and the brokenness you had to experience but so thankful for the testimony you share as a result of your life lived with Him. No matter where we are on this broken road, we are always safely secure in His hands and the hard things.. the difficult things, they reveal how beautiful He really is and how glorious grace feels on us. I look forward to reading more of your sweet soul musings. Thank you so much for your encouragement Sunita! You are such a blessing. Jana, spending 'time' with you is empowering to me. Each of us have a unique testimony, that is what makes it so special! That one specific testimony may be the very on that someone needs to help them see Christ and His pure love and grace. I used to wonder about those of us that didn't have that 'earth shattering' moment of clarity at being saved.....how could they not have experienced that?? Mine was so crystal clear...as a young teen girl...the weight being lifted...the pure sweet love...the g.r.a.c.e! Spiritual maturity comes slowly and I have found that it doesn't matter how we get there as long as we arrive! I know that your words and deeds are the salt and light to this dying world. I for one am grateful for your gifts and that you step out and use them! Looking forward to a week from tomorrow when I can once again study with you and learn when and how to "Keep It Shut"! I love you Jana-girl! Isaiah 41:10!